If you love vintage and retro clothing, you're in for a right treat. Not long ago I came across True Vintage on Twitter and fell a teeny bit in love. True Vintage specialises in vintage/retro clothing and accessories, boasting brands such as Ralph Lauren, Champion, Tommy Hilfiger and Adidas. So imagine my excitement when they offered to send me an item of my choice to try out and review! True Vintage sell sweatshirts, t-shirts, shorts, jackets, coats, shirts and accessories, so you can probably imagine how stuck for choice I was. 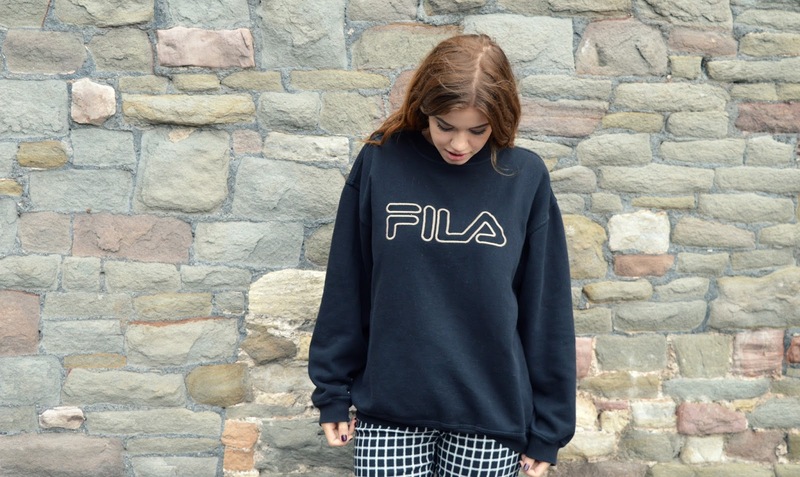 After looking through pages of bright shirts, branded jackets and pretty accessories, I settled on a simple FILA jumper worth £35. Attempting to think practically, I decided that a new sweatshirt would be perfect for the transition from summer into autumn and then winter, and anyone who knows me well will know that I'm a lover of dark clothing! I placed my order and it arrived quickly and promptly. On all items True Vintage states 'Vintage items will usually show a few signs of wear or fading, but anything substantial will be noted', however my sweatshirt showed up in perfect condition without a single mark or sign of wear. The jumper fits perfectly and can be teamed up with anything - it looks good under a pair of dungarees or with a simple pair of jeans or shorts; in the above pictures I wore it with some fitted checkered trousers. It's super comfy and not at all bobbly - something I've experienced when buying vintage items before. The sweatshirt fits well but still has enough room to be comfy and spacious. It's one of my favourite items in my wardrobe at the moment! If you're on the lookout for a good vintage/retro clothing website, I highly recommend True Vintage - the website has so much to offer and my jumper was in excellent condition. All items are priced well considering they are vintage labels and if you hurry you can catch 20% off all accessories using the discount code 'TWENTY20'! I had a pair of fila trainers when I was little that were black and shiny but they got so old and worn my mum chucked them away when I was at school.i was so upset lol. I love vintage clothing! I love a good vintage find, most of my wardrobe consists of it haha! I love rokit but have also heard if true vintage! How fun! That looks great on you and it's something no one else will have! Loving vintage outfit! Yours looks comfy and stylish. Ahhhh Fila.. How this was THE brand when I was growing up!